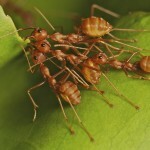 In the artificial swarm collective, decisions are also the result of self-organization interactions between individuals. The kilobot is a small and cheap robot with very limited capabilities. They can move in a straight line or rotate around their center. They have only one sensor with wich they can measure the ambient brightness and the can also exchange message with neighbors robots, and when receive the message estimate the distance of the sender. In the video it is explained the study of collective decision making in a swarm of 100 kilobots. The robots are initially in the nest. From the nest the robots can move to the red or blu side. The goal of the swarm is define consensus on the best side, in this case the red side, (defined by an abstract numerical value). The robot primary goal is to promote its preference, and broadcasting its preference while performing a random walk. Before to move to one site the robot collects preference from his neighbors and applies the majority rule to update his preference and travels towards the chosen side. Then the robot explore the area to determine the site quality. Eventually the robot returns to the nest disseminating his state. In a way similar to honey bees, the robots promote a particular site proportionally to the quality of that site. This modulation mechanism introduces a positive feedback that bring the swarm to choose the best site. Thi project was developed by Gabriele Valentini, Heiko Hamann and Marco Dorigo in collaboration with the IRIDIA, Institut de Recherches Interdisciplinaires et de D´eveloppements en Intelligence Artificielle Universite Libre de Bruxelles.